At its heart, “Smile ” is an autobiographical story of a girl who trips while leaving a Girl Scouts meeting, smashes her front teeth, and spends several years with dentists. But it's also a teen coming of age story, a documentary of the 1987 San Francisco earthquake, and a fun slice-of-life memoir. In documenting her “dental drama,” Raina Telgemeier has created a wonderful, painful portrait of life as it revolved around friends, school, video games and dental procedures that lasted from sixth grade until high school. What I liked most about “Smile” is how honest it is, including details both good and painful. Even on the 10th reading, I cringe at the pages that show Raina tripping and smashing her teeth. Likewise, when she’s betrayed in little ways by her friends, I feel the shame and hurt. Also, although I wasn’t a teenage girl in 1987, I identify with the details: Mario on Nintendo, the DuckTales video game, the 1987 SF Earthquake, and the faux MS yearbook signatures on the end pages. Even when young Raina and her friends see “The Little Mermaid ” is its first release, we later see a figurine of Ariel on Raina’s desk when she’s in high school. Heck, even the details of the dental procedures are accurately captured in jaw-dropping detail. Mom: Lots of kids wear funny stuff to help fix their bodies…you probably just don’t realize it because no one talks about it. Raina: Well, maybe someone should start talking about it!! Raina (thinking): Maybe it would make us feel less like freaks. The art is clean, and casually cartoony. Bug eyes, comic-book icons such as light-bulb ideas, helpful arrows labeling items (“oatmeal”), and the occasion character floating in love add to the ambience rather than detract. The backgrounds are almost architectural. I especially enjoyed the sense of timing, sometimes spending a full page to add emphasis to events. One example of this is when Raina skips out on the Valentine’s dance without meeting her friend Sam. Telgemeier has two 1/6-page frames with setting up Raina’s motivation outside the dance, two 1/3-page frames showing her indecision, and then a single page dedicated to Raina leaving alone while the “boomboom” of the music emanates from the gym. I’d put Telgemeier in the same category as Judy Blume. While the audience for “Smile” is clearly younger teen girls, some middle-school boys will probably also enjoy it. One difference between Blume's books and "Smile" is that the publisher, Scholastic, has made an effort to omit anything scandalous from “Smile.” At Stumptown Comics Fest in 2010, Telgemeier mentioned there was a bit of censorship in the publishing process where Scholastic wanted a reference to "PMS" removed from the book, which she assented to. One more comment: In addition to middle readers, every dentist should have a copy of "Smile" in the waiting room. In comparison to Raina’s journey, a cleaning or a filling for most patients should be a piece of cake. "Smile" was nominated "Best Publication for Teens" for the 2011 Eisner Awards. Raina Telgemeier's website is http://goraina.com. You can read the entire story of Smile online, although it's not in color. When I was a kid reading L. Frank Baum’s "Wizard of Oz " books, I’d sometimes stop mid-story to look at John R Neill’s drawings of fairies, gnomes and other magical creatures of the land, and get so entranced I’d lose all track of the time. 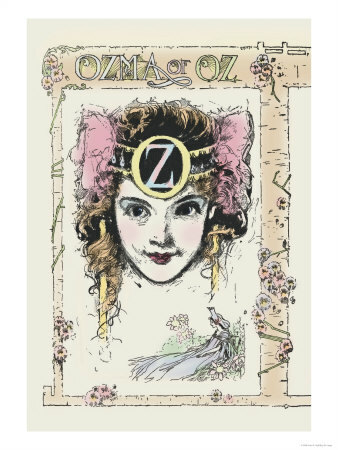 The elegant lines of the dresses of the beautiful fairies, the curlicues embossing the Cowardly Lion, the pretty and mischievous smile of Ozma, the girl ruler, were so expertly rendered I saw them on the page as if they really existed. This sense of wonder and whimsy in the illustrations so perfectly matches Baum’s stories that, even though other artists have had their turn illustrating the Oz stories, in my mind they are as intertwined as a climbing rose and trellis. In "Return of the Dapper Men ," written by Jim McCann and illustrated by Janet Lee, the artists have tried to create a similar work of whimsy, combining a fairy-tale story with lavish artwork, bringing to mind Baum & Neill, the Brothers Grimm, Little Nemo and maybe a touch of William Joyce. The result hovers somewhere between a graphic novel and an extended picture book. In the land of Anorev, time has stopped. The robots live and work aboveground, while the children play in the dark caves underground. Only two beings can travel between the two realms: the boy Ayden and a robot girl named Zoe. A robotic villain named Fabre tries to force Zoe to sprout wings and fly to the majestic broken angel that oversees the land on Anorev. Then, time starts again with the arrival of 314 dapper men, wearing bowlers and carrying umbrellas, flying into town. With their advent, dapper man 41 stirs Ayden, Zoe, and the rest of the beings in Anorev into working toward their destiny. The artwork is definitely worthy of a modern classic fairy tale. The characters sprawl over the page, with bits of detail filling the crannies. The art continuously reminded me of a melding of Winsor McKay’s Little Nemo meets Johnny Gruelle meets William Joyce’s Robots, but was rendered with Lee’s own style, too. A section at the end of the book explains Lee’s meticulous process in "The Making of a Dapper Page." In this digital era, it’s amazing to see an artist who, after doing the layout and illustration, then physically cuts out the images to overlay them on abstract painted backgrounds. "’Return of the Dapper Men’ is a transformational experience, a morality tale that is certain to become an instant contemporary classic. The narrative is instantly captivating and always multi-dimensional. The reader will find puzzles, riddles, and anagrams that serve as catalysts for further investigation and research. Be armed with Google and Merriam-Webster.com in order to enjoy the full-tilt experience of this wondrous read." Frankly, the problem is that the story is both treated too preciously and not seriously enough. McCann has allusions to September 11th, and to tragedies such as Romeo and Juliet and the drama of Tristan and Isolde, but the characters never seem engaged in the story. There are many wide-eyed proclamations, such as "The only boy to write. That’s why you are up here," and "There’s always time for lessons, especially when you have time." Occasionally characters appear to talk to the "camera." Some of the characters seem to be cast as antagonists, but the conflict is all spoken, and never acted on. The only actual threat to all the characters is that time had stopped, and now it’s starting again, which, I guess, means change? In time of no time, the children and the robots had forgotten how to share work and play, and now they have to move forward. Even in allegory, I didn’t find the story very compelling. According to Wikipedia, when Baum was writing the Oz books, his "avowed intentions with the Oz books, and other fairy tales, was to tell such tales as the Brothers Grimm and Hans Christian Andersen told, bringing them up to date by making the characters not stereotypical dwarfs or genies, and by removing both the violence and the moral to which the violence was to point." Although his books were less gruesome than the Brothers Grimm, Baum failed to completely remove the violence. Even in a land where no one dies, the threat of being cut into small pieces and left there for all eternity struck a chord in my imagination that stayed with me. Also, the Wicked Witch, the Nome King, and the other antagonists showed enough malice to keep the plot exciting. I can't same the same about "Dapper Men," which I found beautiful, but not compelling. It appears that "Return of the Dapper Men" is a series, so perhaps this volume is only the prelude to a larger story. Given time, we may find out why time stopped in Anorev, and who sent the Dapper Men, and whether Zoe will ever speak and the answer to many more questions. But, while this book has the artwork of a classic, the story was whimsical without wonder, and left me unfulfilled. "Return of the Dapper Men" was nominated "Best Publication for Teens" for the 2011 Eisner Awards. Weeks ago I bought Shannon Wheeler’s newest book "I Thought You Would Be Funnier ," but I haven’t reviewed it yet for a simple reason: I’m biased. I think that practically everything he does is funny. By way of explanation, I started to list all the work by Wheeler which I've admired, but it started to turn into a comic-artist version of A Fan's Notes (except, I hope, less crazy). Regardless, let's push on. I started reading his Too Much Coffee Man strip years ago when it ran in the back of some local paper. TMCM was a new kind of superhero, similar to The Tick, except he didn't seem to have any powers other than a giant coffee cup attached to his head ( I know it's not part of the suit -- I've seen his skull!). The wry humor, interesting cast of recurring characters, and solid art grabbed and held my attention. TMCM had humor, insight, coffee and bathos. Well, I’m not sure if it had bathos, I’ve never understood bathos, but it had coffee. And Too Much Espresso Man. Somewhere in the mid 90’s, Wheeler traveled all the way from Austin, Texas to a comic book show in Portland, Oregon where I met him in person and discovered that "Shannon" was a skinny guy with long curly hair. Up until then I’d thought he was a she. Not a big deal. It’s the body of work that’s important, not the person. I got over it, and so did my wife. I even got him to sign a book. I guess Wheeler liked his trip to Portland, since he moved to town, and I got more opportunities to buy the books and merchandise at local comic book shows, book signings, Wordstock, and eventually the Stumptown Comics Fest. 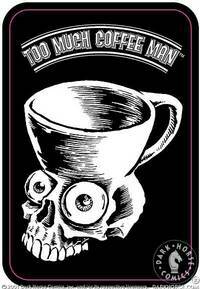 The Too Much Coffee Man T-Shirts (I’m wearing the "pit of despair" shirt right now), the Too Much Coffee Man coffee cups, the Too Much Coffee Man cereal caddy. Ok, I’m joking about the cereal caddy. But I’ve got many of his books: Too Much Coffee Man’s Guide for the Perplexed, for example, and Too Much Coffee Man’s How to Be Happy . Did I mention I wrote a TMCM screen saver? I know it was 1996, because Windows 95 had just come out, and it was late. I designed the program so you could configure the jitters, the anxiety, and how randomly TMCM would meander across the screen. I was so proud that I emailed a copy to Mr. Wheeler, who politely ignored the copyright infringement and wrote back that he owned a Mac, and wasn’t sure whether anyone would be interested in a TMCM screen saver. So, how far can the TMCM thing go? Pretty far, apparently, but before I could tire of it, Wheeler moved in a new direction: the boxed set of "Postage Stamp Funnies ." Designed to recall the look and feel of Maurice Sendak’s Nutshell Library , it's a collection of Wheeler’s weekly cartoons from The Onion. At the book signing at Oregon Historical Society, Wheeler told me that Dark Horse balked at the cost of binding and boxing the comics, but somehow he got the project completed. They’re soooo cute! Turned out the box set was part of a one-two punch, with the production of Too Much Coffee Man: The Opera. Announced as "the first opera based on a comic book," I thought it was a great idea. I heard early versions of the songs at Wordstock, but unfortunately missed the full productions in Portland and Astoria. Something to look forward to, I guess. By that time Facebook had come out, and I’d friended Wheeler, and played a number of games of Jumble or WordTwist (something like that) with him. Like Homer Simpson to Mr. Burns, I don't think Wheeler remembered meeting me, but I was happy to see the occasional drawings he'd post on Facebook. Surprisingly, he started posting rejections from the New Yorker, and finally in 2009 announced his first sale to that esteemed, inscrutable, comic magazine. Frankly, the acceptance policy for comics at the New Yorker is a bit hard to fathom, but maybe that’s the charm. 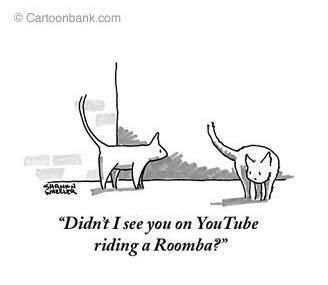 There’s something for everyone, whether you understand it or not. Wheeler started collecting the comics rejected from the New Yorker, and voila, the result is "I Thought You Would Be Funnier. " It’s a quick read - about 100 comics, all of them funny, and showcasing Wheeler’s now-distinctive style. You won’t find any Too Much Coffee Man, but there are a few that echo Too Much Espresso Man. In one cartoon workers are picking beans, and one worker asks another "Tell me again the difference between a cappuccino and a latte." In another, a clown confesses to his doctor "It hurts when I laugh." But, as the great Dr. Emilio Lizardo once said, "Laugh-a while you can, monkey boy." Wheeler’s upcoming project is not all humor and coffee. He’s working with Oregonian columnist Steve Duin on a book called "Oil and Water," a graphic novel based on the Gulf Coast catastrophe of the Deepwater Horizon oil spill. Just like Wheeler's expansion from comics to opera, I look forward to this ambitious project mixing graphic novels with reporting. In the meantime, "I Thought You Would Be Funnier " has two award nominations: in the running for the Eisner Best Humor Publication and the Harvey Special Award for Humor in Comics. Does that sound funny to you? In “Ghostopolis ” the relationship to the afterlife is slightly different than our own. Ghosts have a tendency to sneak back into the world of the living, and the living have the technology to visit the land of the dead. Agent Frank Gallows works for the Supernatural Immigration Task Force sending illegal ghosts back to the afterlife. While working on a case of a skeletal stallion, he accidentally sends terminally ill teen Garth Hale to Ghostopolis, which his boss Lieutenant Brock deems “a real screwup.” Fired from the force, Frank enlists the help of his ghostly ex-fiancée Claire Voyant and her barrier-breaking Plasmapod, a sort of hot-rod that can travel to the land of the dead, to find Garth and bring him back. Meanwhile, Garth wanders the realm, encountering his grandfather, and learning about Joe, the mysterious Tuskegee Airman who created the world of Ghostopolis, and Vaugner, the Machiavellian ruler of the land. 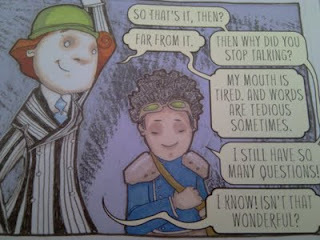 The story has a lot of characterization, and the dialogue includes many kid-friendly jokes that are actually funny. In one running joke, Benedict Arnold betrays himself as a traitor to both sides on multiple occasions. TenNapel shows his skill at comedic timing during the climactic fight scene when Vaugner asks “You know what I’ve got that you don’t?” In the next frame Garth replies “Diarrhea?” The exchange is made even funnier because the two combatants are in the shape of giant battling buildings. The book is about death, but death taken in a comforting way. Given that, I guess it’s no surprise that some Christian themes come through. The airman Joe is a barely disguised version of God, and the crack into the next realm, beyond Ghostopolis could be seen as Heaven. TenNapel has publicly written about using Christian themes in his works, and a story about the afterlife seems a pretty obvious place to discuss Christianity. But for comparison, I found Ghostopolis less about Christianity than, for example, Aslan in the Narnia books by CS Lewis. For the most part the points are integral to the story and don’t seem moralistic or preachy. TenNapel seems to have had a lot of fun with the seven territories of the afterlife: the Specters, the Will-O’-The-Wisps, the Mummies, the Goblins, the Zombies, the Boogeymen, and especially the Bone Kingdom. Dressed in Medieval armor garb, the Bone Kingdom reminded me of a perverse take on Prince Valiant. The art is clean and comic, while moving toward realism when rendering the skeletons. I really enjoyed the scene where Garth and his nightmare are chased through the woods by the remains of velociraptors. Some reviews I’ve read complained about the coloring, but the addition of color seems to bring out the drawings where black and white might have been overly dark. A truly great story, however, must have a truly great antagonist. In Ghostopolis, Vaugner turns out to be a tragic figure, but only in the final act. The extent of his powers, motivations and history is shrouded by the author until this time, and that weakens the character, leading to a slightly weaker story. In my opinion Vaugner would have been more tragic, more daunting if I’d known more about his motivation earlier. Also, his powers seem inconsistent: from atop his office building he’s able to detect and pinpoint Garth’s position in Ghostopolis. Later, however, he’s unable to find the boy in a slightly crowded street. Also, his bug henchmen start out threatening, but end up comic. Vaugner as a villain seems a bit arbitrary, weakening the story. Bottom line, “Ghostopolis” is a fun read, with interesting characters, a rich landscape of the afterlife, and a satisfying conclusion. I’d recommend it to any student from 3rd to 8th grade – and adults will probably enjoy it too. Ghostopolis was nominated "Best Publication for Teens" for the 2011 Eisner Awards. Doug TenNapel's website is http://tennapel.com/comics.html. A movie version of Ghostopolis is listed on IMDB as “In development” for 2013.